Sid Unwin was one of Mary Schaffer's guides during her 1908 visit to Maligne lake. She wrote, "Opposite our camp rose a fine snow-capped mountain down whose sides swept a splendid glacier. As we paddled slowly in sight of it, (Unwin) suddenly looked up and said, 'That is the mountain from which I first saw the lake.' So we promptly named it Mount Unwin." 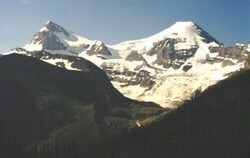 The mountain is best seen from part way down the lake as one approaches Spirit Island. "Unsurpassed in woodcraft and resourcefulness, unequaled in thoughtful kindness to his party, and with the charm of courteous manner that adds the final touch of perfection to the little self-centred microcosm that a party in the wilderness constitutes." This was the tribute paid to Sid Unwin by B. W. Mitchell following several trips in the Rockies with this legendary outfitter. Regarded as one of the most capable of the trail guides during the years of exploration in the Canadian Rockies, Sid Unwin lived an adventurous but short life. Born in London, England, for some reason he was drawn to the mountains of Canada where he set up a guide and outfitting business and spent the winters trapping in the Mistaya Valley near Waterfowl Lakes. While crossing Bow Lake one winter afternoon, the ice broke beneath him and, with a heavy pack and snowshoes he, "felt for a minute that it was all over. Then it came to me that I just couldn't die yet. I'm young and life is good." An incredible effort must have been required to save himself. Upon regaining the ice surface, his clothes immediately froze as he struggled to the shore where, with matches from a waterproof metal box he carried just for such emergencies, he lit a whole tree on fire to get warm before building a bonfire, disrobing, and drying his clothes. In 1908 Sid was one of the guides for Mary Schaffer and Mollie Adams as they set out to search for the lake now known as Maligne. After struggling for days through burnt out forests, they began to descend the Maligne River from Maligne Pass. The party was becoming dispirited and beginning to doubt the accuracy of the map they were following. After stopping for lunch Sid abruptly announced, "I'm going off to climb something that's high enough to see if that lake's within twenty miles of here and I'm not coming back till I know!" Returning to camp at 10:30, all were excited to hear that he had climbed a mountain to the east of their camp and was able to look down upon the elusive lake they were seeking. Later they all enjoyed the explorations of this the longest lake in the Rockies. Together with Mary Schaffer, Sid returned to the lake in 1911 to complete a more detailed survey of the area at the request of the Parks Department. Sid Unwin's adventures in the peace and tranquillity of the Canadian Rockies were preceded and followed by other adventures amongst the horrors of war. Prior to coming to Canada he had fought with distinction in the South African War. Then when the First World War broke out in 1914 he asked his sister Ethel to take over his pack and saddle-horse business and Sid enlisted in the Canadian Army which assigned him to the 20th Artillery Battery at Lethbridge. In January 1916 the Battery saw its first action in France and a year and a half later during the Battle of Vimy Ridge, Sid was severely wounded after single-handedly manning an artillery battery. The position was being shelled and Sid ordered all his men to leave the battery and go back to their dug-out because, "It's too dangerous; the Boche has the range." Sid did all the loading and firing single-handedly even when one of his ammunition pits was set on fire by a direct hit. Lieutenant E.K. Carmichael, Sid's commanding officer, wrote, "I was so much pleased with, and admired his conduct, that I committed the circumstances to paper at once in case of accidents, so that if anything did happen to me, the paper would bear witness. Sid later died of his injuries in a military hospital. A last letter, written in a left-handed scrawl from a military hospital, proved that his spirit had not been broken: "Aside from having my right arm blown off, being almost stone deafened by shell fire, and having my head full of shrapnel fragments, I'm fine and dandy." Despite his desire to serve his country and this indomitable spirit while in the horrid trenches of France, he must have longed to return to the days he spent sailing H.M.S. 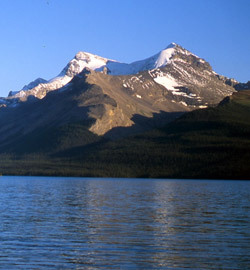 Chaba on Maligne Lake. For I am bruised and short one arm." -- Sgt. Sid Unwin, May 27, 1917.